He 2-111 (PK 315-0.1) was discovered by Karl Henize in 1967. Based upon deep plates from the Anglo Australian Telescope, B. Louise Webster in 1978 described a giant halo around this planetary nebula located between the huge binary star, Alpha Centauri(off lower right) and open cluster NGC5617 (off upper left)in the southern constellation of Centaurus. 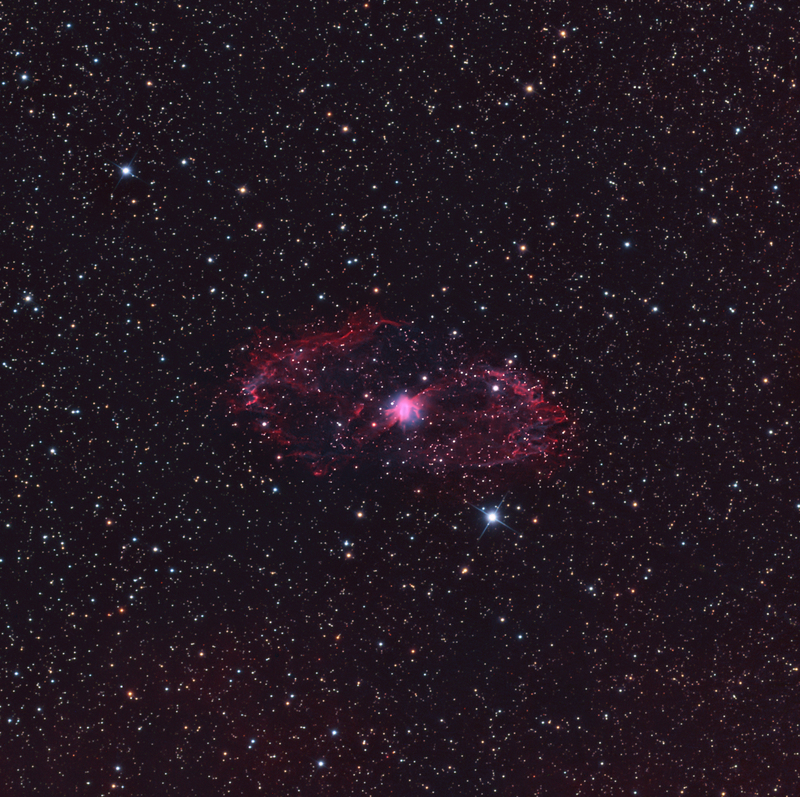 A cropped image is presented above to better show the nebula. A full image is presented below, where the golden colored star cluster in the frame near the upper left corner is Pismis 19, estimated to be 1 +/-0.2 billion years old and reddened due to intervening dust. He 2-111 is estimated to be about 7800 light years distant and 15 light years across. Webster indicated that this halo has a radial velocity range of 400 km/s, which is greater than observed in any other planetary nebula.She indicated that the shape of the extended halo suggests a cylindrical symmetry. The small, pinkish core shown in the image above has structure, and is <30� in size. The outflows from this core toward the upper right and lower left seem to continue into the two opposing lobes of the halo, as if they are twisted into a torus. The extremities of the halo have knots and a mixture of both OIII and H-a. North is toward the lower left and the field is approximately 36 x 36�. The image consists of 8.5 hrs of 3 nm H-a, 5.5 hrs of 3 nm OIII and 1 hour of RGB for star color for a total exposure of 15 hours. H-a was color-mapped to red/magenta and OIII mapped to bluish-green to create a “natural color” image. RGB star colors were created based upon a G2V calibration. Thanks to Sakib Rasool for suggesting this interesting object. 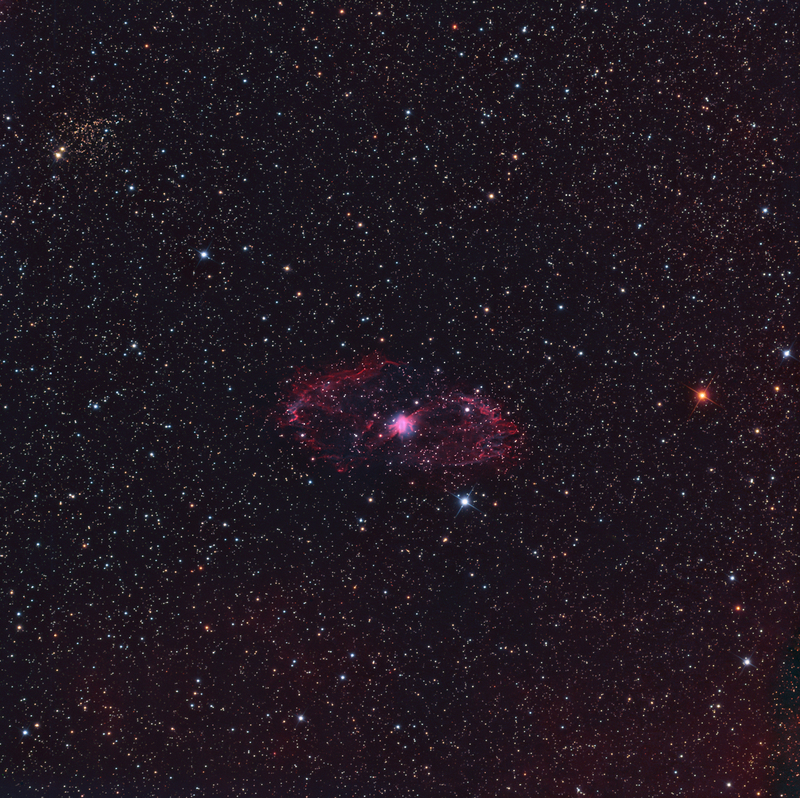 This is the first image processed from the new iTelescope.net site at Siding Springs in Australia with a new PlaneWave CDK20 telescope on a PlaneWave Ascension A200h mount.